A small gesture can go a long way, especially if its dark chocolate filled with delicious creamy peppermint! 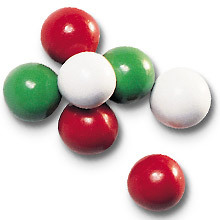 Enjoy our creamy peppermint centers dipped in dark chocolate with a mint candy shell in Christmas red, green, and white. Price quoted is per pound, not including shipping.